Join us for an informal Information Session to learn more about the Community Leaders Fellowship! You probably know folks–young or old–who would like to forge a more meaningful career path. Maybe it’s your 20-something son, your neighbor, or even yourself! JP NET’s Community Leaders Fellowship (CLF) can help folks who want to make their community–and the world–a better place. The CLF is a five-month program where participants gain hands-on experience with one of JP NET’s community-based projects, such as the Boston Food Forest, Time Exchange, or Bilingual Event Series. We also provide personalized career coaching and tailored support. The CLF believes that every person has a role to play in creating the future we want. Let us help you find yours. Volunteer with JP NET at Wake Up the Earth! Bring a dish to share if you can, but come either way! In December, Bill McKibben, founder of 350.org, tweeted that soil was “a rising star” at the Paris climate talks. Join us at this JP Forum to explore the reasons for that hopeful statement. We’ll consider the promise of soil restoration to capture carbon while providing benefits for food production and ecosystems. We will also discuss the opportunity to strengthen the climate movement by including nature as an ally and enlisting the agricultural sector. 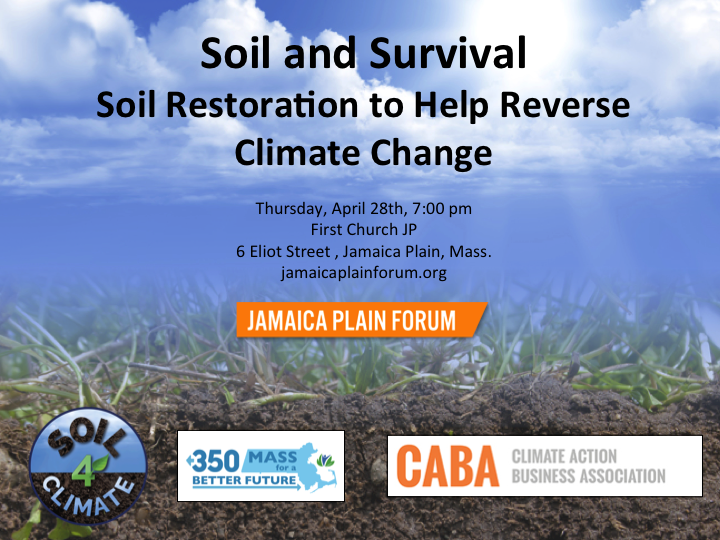 Please join us to find out how soil restoration can help mitigate climate change! Seth Itzkan is co-founder of Soil4Climate. Quinton Zondervan is president of the Climate Action Business Association. Kannan Thiruvengadam runs a community farm in East Boston using permaculture principles. A representative from the French consulate, who will speak the French commitment to recapture carbon through soil sequestration. 6th Jamaica Plain State Of Our Neighborhood event! View the documentary based on Naomi Klein’s book of the same name that weaves together threads of climate, racial and economic injustice and the movement of movements already rising for a new, non-extractive economy. 7:30 pm: Small group discussions. How can we take action? And Still We Rise is a collaborative theater project featuring former prisoners and their loved ones. Join us for a performance that will weave the personal experiences of the actors—stories of imprisonment, survival and re-entry—into a gripping afternoon of theater. Q&A session will follow. And Still We Rise is dedicated to healing, public awareness, and social change through empowering the voices of formerly incarcerated people and their loved ones. Help participants gain skills and self-confidence in shaping and asserting their personal stories. Weave their story-telling together into performances that move audiences to greater understanding and compassion for the struggles of these and other individuals who spend years incarcerated and then strive to integrate back into society. Create a vital public forum where participants bring greater awareness and engagement to pressing criminal justice issues. Join us for what promises to be a rich afternoon of theater and discussion. Suggested donation is $12 at the door, but no one turned away due to lack of funds. Free JP Time Exchange T-Shirt for the first 25 Members to arrive! The JP Time Exchange is turning 1, and it’s time for a party! Members and non-members, please join us for a Birthday Party and Stuff Swap on Saturday, February 27 at Urbano in the Brewery Complex near Stony Brook. No need to bring anything – feel free to come, browse the stuff, and take what appeals to you – or take nothing at all! You’ll also have a chance to learn more about the Exchange, brainstorm your own gifts and needs, enjoy music and chat with great neighbors. Members can earn Hours for volunteering at this event! Contact Sarah if you can help, sarah@localcircles.org. What to Bring: Small appliances, lamps, arts and craft supplies, tools, kitchen items, small functional electronics, books, DVDs, CDs, toys, baby gear, home décor, gardening tools and supplies, or other useful small items. What NOT To Bring: Please do NOT bring furniture, clothes, linens, towels, or broken electronics. Items that do not find a home with be donated elsewhere at the end of the day. About the JP Time Exchange: In a Time Exchange, members share skills and provide services for each other, such as cooking, sewing, carpentry, pet care, health care, and much more. When you provide an hour of service, you are credited with one “TimeHour” in your online account. You can use that Hour for services you need or want that other members are offering – like child care or massage! Read more: http://jptransition.org/time-exchange. Un camisa de JP Time Exchange gratis para los primeros 25 miembros que llegen! El JP Time Exchange (JP Intercambio de Tiempo) esta cumpliendo un año y vamos a celebrar! Miembro o no, todos estan envitados. La celebracion sera el 27 de Febrero empezando a la 3 de la tarde en Urbano, localizado en el Brewery Complex cerca de la estacion Stony Brook. Vamos a tener un intercambio de cosas. No necesitas traer algo si no quieres. Puedes venir a ver y si te gusta algo, te lo llevas. Va ser un a buena opportunidad para aprender mas de JP Intercambio de Tiempo, discutir sus talentos y necessidades. Disfrutar la musica y pasala bien con tus vecinos. Regalar las cosas que no quieres pero que le puede servir o gustar a otra persona. Escoger cosas para llevarse a tu casa. Aprender mas de el Intercambio de Tiempo de miembros que le han servido. Miembros pueden recibir horas por ayudar en este evento! Si estas interesado, contacta a Sarah a sarah@localcircles.org. Que se puede traer: Pequeños electrodomesticos, lamparas, articulos de manualidades, heramientas, utensilios de cocina, libros, peliculas, CDs, jugetes, articulos para bebes, decoraciones de casa, articulos para jardineria y cualquier otro articulo pequeño que puede ser util para otra persona. No traigan: Muebles, ropa, ropa de cama, toallas, y electronicos que no fucionen. Articulos que no encuentren un hogar van a ser donados al final del dia. Mas sobre JP Time Exchange/JP Intercambio de Tiempo: En el Intercambio de Tiempo, miembros comparten sus talentos y especialidades con los otros. Los intercambios varian por persona y incluyuen cocinar, carpenteria, cuidado de animales, y muchos mas. Cuando un miembro dedica una hora de servicio, recive una hora en su cuenta. Las horas acumuladas se usan para recivir un servicio que quiere o que otro miembro esta ofreciendo. Para leer mas visite: http://jptransition.org/intercambio-de-tiempo.